They taste just like the caramel apples you’d get from a bakery. They’re made without the white sugar, corn syrup, cream, and butter. Ummm, it’s Friday… treat yo’self. If you’re all about that Caramel Apple lyfe but corn syrup and butter ain’t your thang, then the stars aligned and these were surely made for you. But really now, who wouldn’t want a sweet, crunchy apple coated in rich, sticky caramel? A deranged person, that’s who. These are so addicting you’d NEVER suspect they’re refined sugar free (yup, no corn syrup whatsoever! ), dairy free, and vegan. 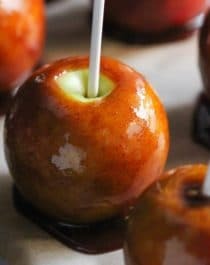 Love Caramel Apples but don't want all the calories and sugar? 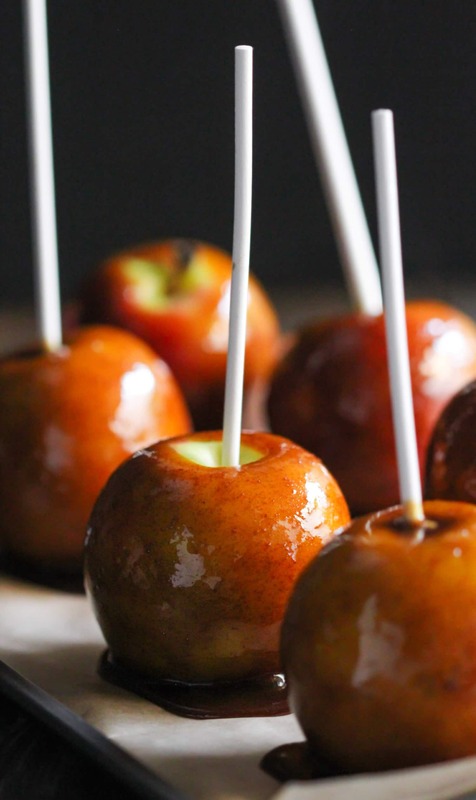 Make these homemade Healthy Caramel Apples! Made vegan without the corn syrup and butter! In a small bowl, whisk together the coconut milk, coconut oil, and salt. Set aside. In a 2- or 3-quart saucepan, add the maple syrup, water, sucanat, and erythritol. Do not stir. Add a candy thermometer to the pan and place over medium-high heat. Without stirring, let the mixture come to a boil. When it reaches 250 degrees Fahrenheit, whisk in the set aside coconut milk/oil mixture. Let the mixture come to a boil again. When it reaches 266 degrees Fahrenheit, remove from the heat and whisk in the vanilla extract. Let cool slightly while you prepare the apples. Line a cookie sheet with a silicone baking mat or parchment paper and reserve a spot for the pan in the fridge. Place the apples on the pan and pierce cake pop sticks or popsicle sticks where the stems used to be. One at a time, dip the apples into the thick caramel. Let most of the excess caramel drip off, then place the apples back on the cookie sheet. Refrigerate until firm, then serve and enjoy! THAT JUST WARMS MY WEE LITTLE HEART! Want to join the healthy dessert club? Subscribe to the newsletter and get decadent, yet healthy, treats sent straight to your inbox... FREE! Indulge − no strings attached! Could you make a recipe without added fats like Coconut Oil and Coconut Milk? Join the Healthy Dessert Recipe Club! Never miss a recipe, and get treated with some exclusive recipes and free goodies! DIY Protein Bars: Easy, Healthy, Homemade No-Bake Treats That Are Packed With Protein is a collection of 48 ahhhmazing protein bar recipes! PDF Download available on Etsy. Print and Kindle available on Amazon.com. Desserts With Benefits® is a participant in the Amazon Services LLC Associates Program, an affiliate advertising program designed to provide a means for sites to earn advertising fees by advertising and linking to Amazon.com. ©2019 Desserts With Benefits. All Rights Reserved.